When I decided to simplify my life and reduce my belongings, I made an exception. I quietly told myself that holidays wouldn’t count. I wasn’t going to be one of those bah-humbug minimalists who didn’t exchange gifts. 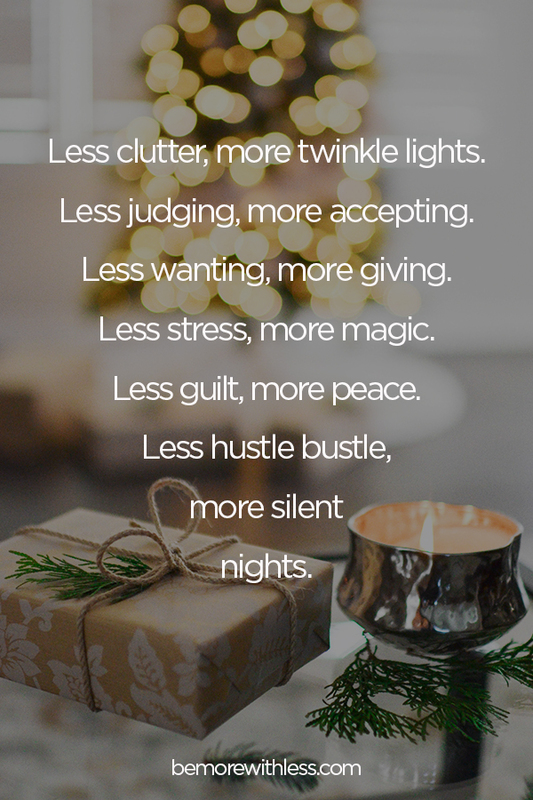 Slowly though, year after year, I wanted less … fewer gifts for me, less time shopping for the perfect presents, and definitely less stuff left over when the holidays were through. And, year after year, I wanted more too. I wanted more time to notice the magic of the holidays. I wanted to give more to charitable organizations. I wanted to be more present, to give more attention to moments as they were unfolding. When I was trying to figure out what a simpler version of the holidays would look like, I found inspiration from others, and then I did what was best for me. You get to decide what’s best for you and your family too. Presence before presents and then gifts, no gifts, some gifts … you decide. It takes time to simplify the holidays. The shift happens when you start to be thoughtful about how you spend your resources (time, money, attention, emotion). Even more will change when you do what’s best for you and your family regardless of what anyone else may think about how you spend those resources. It’s not up to them. If you decide you want to buy gifts without adding clutter, here are a few things that aren’t really things. 31 Days of Gifts You so Deserve: A little Advent calendar for your inbox through the month of December. We’ve had book clubs, corporate offices, community groups, churches and families spanning the globe participate together. Sign your friends and family up here. The first gift arrives December 1st but you can start anytime! Meditation: Give the gift of guided meditation with the Headspace App. You can gift anywhere from a month at a time to a lifetime subscription. Start a tiny book club: Invite a friend to start a tiny book club with you. Gift them a Book of the Month Club membership and you can pick from a selection of books each month to read and chat about. If you prefer to listen to books, gift an Audible membership. Getaway: Plan a weekend getaway in an Airbnb property. AirBnb now has local experiences available too. From creative and cooking classes to outdoor adventures, gift an experience and make memories. Enjoy a no-prep home cooked meal: Send a gift of healthy meals ready to be cooked at home. Sun Basket offers options for Paleo, Gluten-Free, Dairy-Free, Soy-Free, and vegan diets. Workout: Help your friends and family jump into their fitness resolution with a gift card to ClassPass. A ClassPass subscription offers different classes at studios all throughout the United States. Try yoga, Pilates, cycling and other fitness classes. One less gift: If gift giving isn’t for you this year, and you want to give your friends and family permission to opt-out, send them this certificate for one less gift. Whatever you decide when it comes to giving gifts, this is my holiday wish for you: Less clutter, more twinkle lights. Less hustle bustle, more silent nights. Less judging, more accepting. Less wanting, more giving. Less stress, more magic. Less guilt, more peace. More love, always more love. I’m looking forward to this! Thank you! You are a gift. Great idea! This is was it’s all about! Thanks Courtney, this is a timely reminder. Best wishes of the holidays to you! I love this! I have worked through gift giving vs minimalism, and I found that a lot of my friends (and a lot of my minimalist friends!) use gift giving as their love language. I try to find very inexpensive, but extremely heartfelt, gifts to give my friends. I love your list, and I have something to add. A gift certificate to a local yoga studio that you love, would be perfect! I go to a small, tight-knit, locally-owned (by a minimalist!) yoga studio, and I want to give gift certificates to my friends who practice there. Thanks for sharing this! I’m actually “one of those bah-humbug minimalists who don’t exchange gifts”… And I like it that way 🙂 Nevertheless, great tips! I bought small toy gifts to hold “money” gave “gift cards” wrapped in bigger boxes. Gave me extra time to enjoy the holiday and parties. This was the first relaxing holiday season. Cutting down on shopping was a winner. I love your site.